We encourage eCabinet Systems Members that have production time available on their Thermwood CNC routers to offer machining services to other eCabinet Systems users. This type of collaboration is at the core of a cooperative and benefits both parties. To help support this, we maintain an area on this web site where Thermwood CNC Router owners can post their name, services offered and contact information. We also encourage Production Sharing Members to attend industry trade shows and welcome them to use our show booth to meet with prospective eCabinet Systems customers. Arrangements are made directly between the parties and, other than trying to bring Members together, we are not involved in these transactions and there is no cost for our services. The eCabinet Systems program and Thermwood’s CNC technology offer a unique opportunity for this type of cooperation. Thousands of Members using common software brings consistency to the data and file structures and makes exchanging designs simple. Even more important, however, is the approach that Thermwood has taken to creation of the actual CNC program code. First, you must realize that, like fingerprints, every CNC machine is unique. Differences between some machines may be small while differences between others may be major such as different sized tables or different head configurations. The CNC program used to machine your parts must take into account the specific machine on which the program will run. You cannot use the same CNC program to machine parts or different CNC routers. Each must have its own CNC program that takes into account its unique characteristics. Everyone except Thermwood develops the CNC program code in the office using the design software. They then use a software program called a “post processor” to tailor the CNC program to a specific machine. Each machine requires a unique post processor. This approach doesn’t work very well when trying to share CNC production between a lot of different shops. Thermwood’s approach is to use the design software to create the design and use the CNC control to create the actual CNC program needed to make the design. 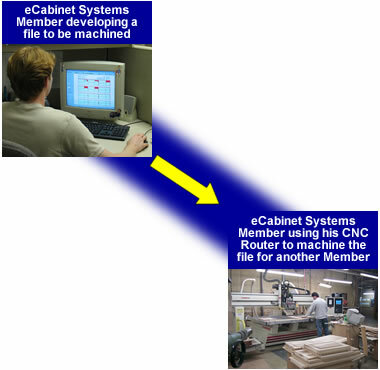 The eCabinet Systems CNC output file defines the parts that need to be machined. The Thermwood control take this file and automatically nests the parts and creates the CNC program needed to make the parts. This approach works well because each control develops a program that works properly for that particular machine. You can send the same CNC output file to a dozen different Thermwood machines and each will make the same identical parts, even though no two machines are identical. This basic approach is key to making Production Sharing straightforward and easy and opens the door to a new level of cooperation within the industry.